229 Fore the Gripes in Childbead I [wish?] this to be used which I know to be singular good for any stoppage by sudden cold in Childebed. 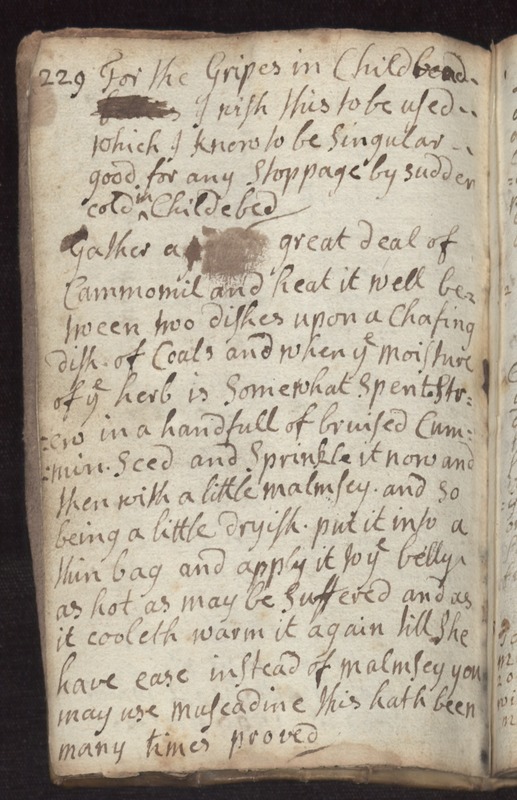 Gather a great deal of Cammomil and heat it well between two dishes upon a Chafing dish of Coals and when ye moisture of ye herb is somewhat spent strew in a handfull of bruised Cummin Seed and sprinkle it now and then with a little malmsey and so being a little dryish put it into a thin bag and apply it to ye belly as hot as may be suffered and as it cooleth warm it again till she have ease instead of malmsey you may use muscadine this hath been many times proved.